All Red Bull Editions are based on the same formula but feature a different taste identifiable by the product’s color. 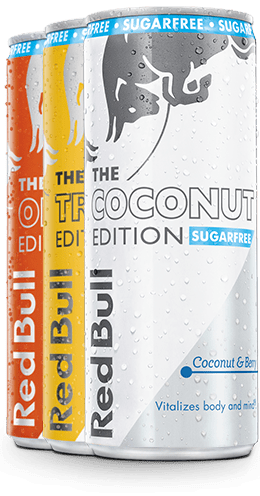 The Editions’ variations are characterized by an exquisite orange (The Orange Edition Sugarfree), tropical fruits (The Tropical Edition Sugarfree) and coconut & berry (The Coconut Edition Sugarfree) taste. Learn more about Red Bull Energy Drink.